Competitive Pricing to Help you Grow! What is it? 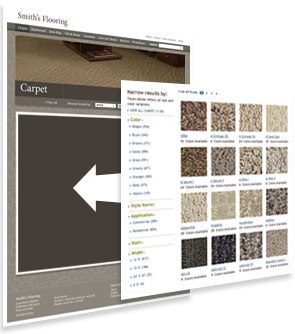 Complete Flooring Website with Product Catalog Complete customization to your taste! Complete customization to your taste! Here are more digital tools you may need! Get more marketing tools for less! Log in to Shaw Advantage now to see how much Co-op you have. Visit our Services page for more details on each digital tool. * Aligned With Shaw? Contact us to learn about special pricing. Get More Out of Your Website! Google Paid Search: Get AWESOME Leads from your Shaw Web Studio Site. More Details Here. Retargeting: Marketing To Consumers After They Leave Your Website. More Details Here. Display Ads: Stand out from your competition in search engine advertising spaces. More Details Here. Social Media: Reach Your Customers where they want to be reached. More Details Here. Package Details: Local optimization for 100 geo-targeted keywords. Listings in 75 plus online business directories. Google My Business Verification & Information Update. Local optimization for 150 geo-targeted keywords. Listings in 75 plus online business directories. Google My Business Verification & Enhanced Information Update & Monthly Posts. The Web Studio SEO program not only commits to improving your ranking in search engine organic results, we guarantee the results! If your website does not deliver our promised SEO results, you get your money back!